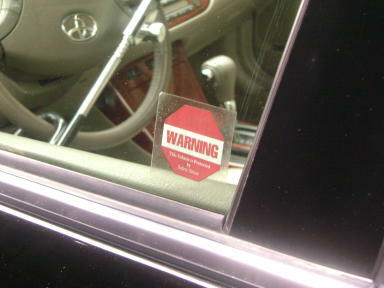 The CLUB Vehicle Security Decals may deter theft by giving the impression that your vehicle is protected by an alarm. The Decals attach to the inside of the vehicle windows protecting them from the elements. Potentially, a would-be thief sees the decals and assumes an alarm is installed inside, thus causing the thief to look elsewhere for an easier target. Winner International recommends layered security so for added protection purchase a Club steering wheel lock. These are decals only. No alarm is included with this product.